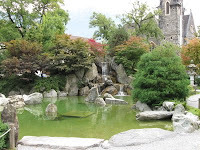 Europe Adventures: Interlaken, Switzerland - Yo Da Lay He Hoo! And yes, if you are wondering we've talked about the game on The Price is Right many times about the little climber who falls of the cliff if you over bid. Okay, with that said. I think we have gathered enough information to correctly say that all hostel breakfast are the same. Not bad, not good, just the same. We had breakfast at the hostel with high hopes of some hot food, no dice. After filling on european cereal we took as Heather calls it, "the machine that does the walking for you" up the very steep mountain/hill into the center of Bern. At the train station we were sad to see they were no longer giving out free ice cream like the day before. The train to Interlaken from Bern is only about 50 minutes. Charlie wrote yesterday's blog while Heather read. The journey was beautiful. Many times we'd point out the window, then our jaws would hang slack at the sight of these mighty mountains and turquoise lakes on both sides. So far Switzerland has two very excited fans. 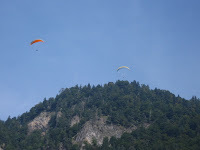 Interlaken was taken off the trip plan but happily added back on a few days ago when Berlin was cut out. 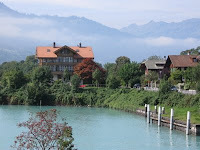 Interlaken is a small town surrounded by two mountains and two lakes. 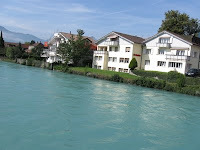 (Hence the name Interlaken) The Aare River flows through the town. 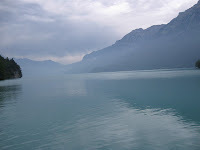 Interlaken is located between Lake Brienz to the east and Lake Thun to the west in the area called Bödeli, however the main attraction is probably the magnificent Jungfrau mountain (4158m). 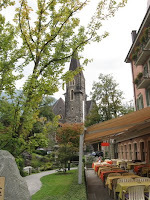 The town couldn't have been more traditional Swiss and we were very very happy! First we wondered the town looking at all the little outdoors, ski and snowboard stores. After a while we decided it would be a good thing to try to find one of these two huge lakes. We had no map this time so headed off in a direction we thought logically made sense for a lake to be. 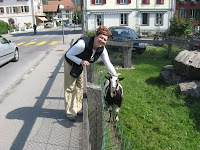 Along the way we saw cute Swiss chalets, Swiss watch shops and made friends with two goats named Julie and Marco. We were noticing the town getting a bit more country as we headed toward more farm country. In the distance we could hear wind chimes on a few houses... how cute. 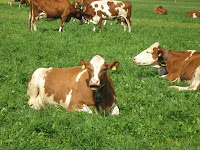 Heather made a smart remark about: "it's probably a bunch of roaming cows with bells around their necks." You guessed it, she was right on. 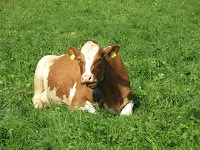 We had a good laugh watching these very noisy cows wonder around while we took some pictures. Thinking the cows meant we'd gone too far we headed back to town to see our two friends the goats and look for lunch. Neither of us our sure how normal people eat in this town, it's unbelievably expensive!! Average meal was about 35-40 Swiss franks per plate.. yikes no thanks. We found some reasonable food to share and two new Swiss beers to add to our list. 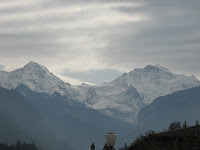 The city was so beautiful with it's small town old world charm and snow capped mountains. We walked quite a ways down the river to one of the lakes. We must have sat down in silence for almost 1/2 hour just enjoying this peaceful place. On our walk back we imagined what this city would be like in all the different seasons. Para-gliding was a big attraction this time of year, it was fun to watch all the people circle the city and land in the center park. On the train ride back we walked through the dining car. It was a lot like the one on White Christmas... too bad we don't have any Swiss franks or it would have been fun to sit down for a snack. Charlie is not feeling the best, well honestly both of us are extremely tired! We make our way back down the big hill/mountain to our hostel to find out where our new room is. Turns out we'll be in a BIG room, 20 beds.... yikes. Charlie took a long nap hoping to recoup a bit while Heather got ready and did some planning for the next few stops. Hungry as usual we head back up the big hill/mountain. One of the nicest things about Europe is the spontaneous little things that are always going on that we've just stumbled into. We followed our ears to the sounds of a choir singing. 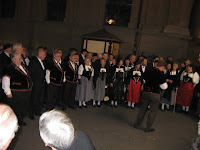 A traditional Swiss choir was singing in the main square all dressed in tradition costumes. One song was even complete with yodeling which made us both smile from ear to ear. Too tired to really enjoy a meal out we did our traditional stop at the co-op for some bread and meat to go with our cheese from the picnic the day before. We took our meal back down to the hostel and ate while listen to a pretty intense football game on tv. With an early train to catch to Munich, Germany in the morning we hit the hay. Draw your own conclusions of how much sleep we got in a room with 20 people coming and going all night. Ughh. So have you seen many bernese mountain dogs? They originated in Switzerland ya know. Ernie would fit right in, we could put a bell on his collar and he could sun-bathe in the cow field all day:) Hope your having a fantastic time! I would have to say, I am the most jealous (and also get a strange urge to cook) of the great food! where the heck was this hiding?? I didnt even see it until today... and heather im sure you were very excited to be able to pet something (for free) -- Im pretty sure that grant has been somewhere there for ski'ing. We move in 18 days !! !